Typically yellow, brown or gray to colorless. Less often blue, green, black, translucent white, pink, violet, orange, purple and red. Big diamonds are very rare, and are worth a lot of money. Only 20% of diamonds are fit for jewellery. The other 80% are of lower quality. They are industrial diamonds, used to make things like drill bits and diamond saws. Even if a diamond is not of gem quality it still has a value because It is very hard. Cut and faceted diamonds can be attractive hence their use in jewellery. 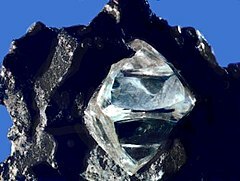 Diamonds are very effective electrical insulators, but also very good conductors of heat. On Mohs scale of mineral hardness, diamonds are scored as 10 (the highest score possible). ↑ "Diamond". Mindat. Retrieved July 7, 2009. ↑ "Diamond". WebMineral. Retrieved July 7, 2009. ↑ Carlson R.W. 2005. The mantle and core. Elsevier. p. 248. ISBN 0-08-044848-8. The Simple English Wiktionary has a definition for: diamond. This page was last changed on 19 March 2019, at 21:16.